Yesterday’s New York Times contained an essay on Abreham Zemedagegehu – a homeless, Deaf, Ethiopian immigrant – who received an iPad from their Neediest Cases Fund, and uses it to communicate via Video Relay Service. For the past 100 years, The New York Times Neediest Cases Fund has provided direct assistance to children, families and the elderly in New York. To celebrate the 101st campaign, an article will appear daily through Jan. 25. Each profile will illustrate the difference that even a modest amount of money can make in easing the struggles of the poor. The article goes on to say that basic – day to day – communication has been facilitated for Mr. Zemedagegehu by ASL interpreters and a Video Relay Service. Just over a thousand dollars was drawn by the fund to pay for an iPad, allowing him to access the Relay from any WiFi hotspot, such as Starbucks or Whole Foods. This is just one area where the Internet and like technologies can be used to assist the Deaf. Mr. Zemedagegehu, a naturalized American citizen, came to this country about a half a decade ago, via an immigration lottery. He has taken language courses at Gallaudet, and he maintained a home and a job at Fed-ex until a back injury forced him out of work. Although he receives Disability, the payments are too small to afford an apartment, and he ended up on the streets. He is working with the Department of Housing and Urban Development to find an apartment while waiting to receive job training from the state’s vocational rehabilitation program. There are few options that require little verbal communication and minimal physical labor, but Mr. Zemedagegehu has some ideas: maybe something at the post office, or as a meter reader for gas and electric utilities. 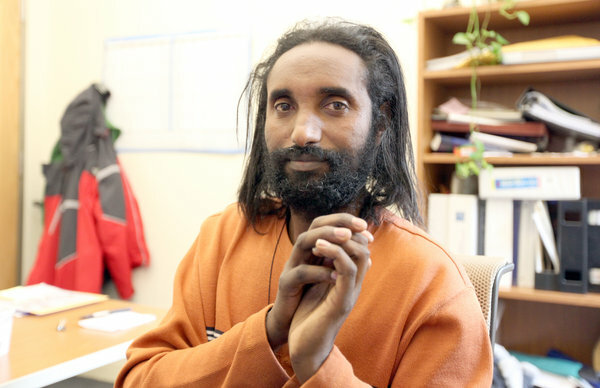 After he gets a job and an apartment, Mr. Zemedagegehu wants to fly home for a visit and share his story in church. “I had a good experience because I’ve been homeless,” he said. He has studied how people treat him compared with the wealthy, and he imagines his sermon would ask, “If suddenly you had a disaster, how would you have it?” His faith teaches him that the greatest among us might live modestly. “Jesus even slept on the streets,” he said. My gratitude to the NewYork Times for this piece. To see the original article, click the link below. Posted in Editorials, ReBlogs.Tagged #JusticeForFelix, American Sign Language, BitcoDavid, Deaf in Prison, DeafInPrison.com, Gallaudet University, Homelessness among the Deaf, iPad, Posting Mania - Year 2 Explodes, Video Relay Service. Previous Post How Cool is This!